Do you know that paper comprises 40% (or higher) of your overall print spend?The GBS Directed Paper Program provides unprecedented control, tracking and measurement of all components of your corporate paper spend. With the backing of our consolidated buying power, you now have unprecedented control over your paper supply chain. See the difference in how things have traditionally been done versus the GBS Directed Paper Program. GBS moves you behind the wall of isolation and puts you in the center of the entire buying process. You now have complete control over every facet of your paper spend, ensuring consistency, accountability, and most importantly, direct positive impact on your bottom line. 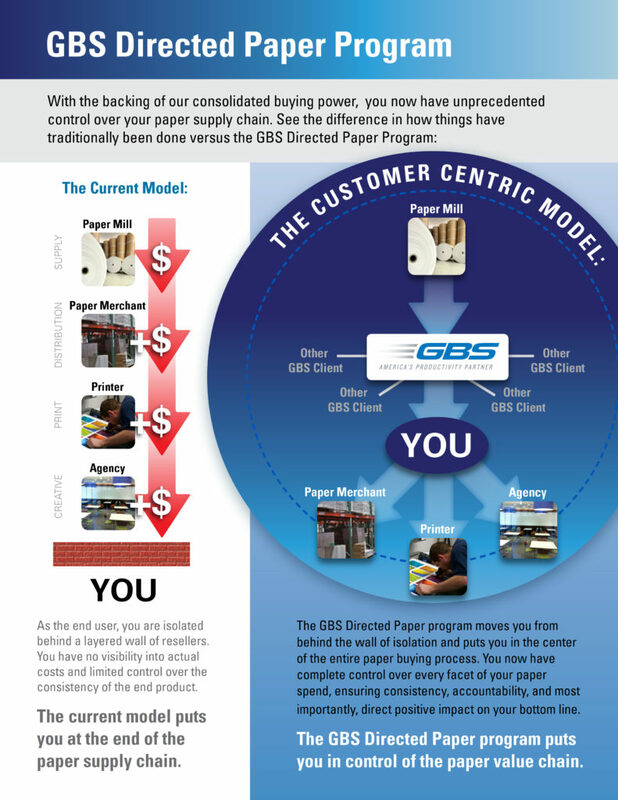 The GBS Directed Paper Programs put you in control of the paper value chain. View our Directed Paper Management Program brochure to learn more.